The Court of Arbitration for Sport (CAS) is the world’s leading sports law forum and was established on 30 June 1984. Having its headquarters in Lausanne, Switzerland, CAS is regarded as the only tribunal that can hear disputes over the interpretation of the Olympic Charter; it is the sole tribunal of appeal from decisions of the world Anti-Doping Agency and the final tribunal of appeal for many major international sports federations. This position at the top of the sporting-legal world and the general acceptance of its decisions has required CAS to ensure that its reasoning is grounded in appropriate legal basis. In looking not only to the form and substance of the sporting rules before it but also by drawing on what are generally considered to be universally accepted legal principles when forming its opinions and advices, CAS jurisprudence is creating what is becoming known as a transnational, universally applicable sports law. CAS is independent of any sports organisations and is considered the highest international dispute resolution forum for legal cases relating to sports, including commercial disputes (e.g. issues arising from sponsorship agreements or player contracts) and discipline (e.g. doping, non-compliance with codes of conduct). It also acts as an appeals court for decisions made by sporting organisations’ own arbitration systems or dispute resolution mechanisms, including global associations with disciplinary arms such as FIFA and the International Olympic Committee. In May 2012, Abu Dhabi, the capital of the UAE, became one of only four cities in the world to host a permanent CAS court, the other cities being Lausanne, Sydney and New York. CAS Abu Dhabi is a joint venture between the International Council of Arbitration for Sport (ICAS) and the Abu Dhabi Judicial Department. This joint venture agreement was signed as per the directives of Sheikh Mansour bin Zayed Al Nahyan, Deputy Prime Minister of the UAE and the Minister of Presidential Affairs. According to the agreement, the CAS Abu Dhabi Centre will hold arbitration hearings, organise meetings, seminars and other activities related to the development and promotion of sport’s legal aspects in the region. The Abu Dhabi office of sport’s highest court will also handle local, regional and international sports-related disputes and provide the required facilities to conduct video calls with experts and witnesses from around the world. The facilities include onsite meeting rooms, communications and internet infrastructure, audio and videoconferencing systems and technical equipment as well as all human resources required to operate the centre. The launch of a CAS facility in Abu Dhabi will provide the opportunity for specialised adjudication of sports related disputes, something that is becoming more common in the Gulf with the rapid rise of participation in sports and the hosting of major sporting events. In such cases, conducting hearings (live or via the centre’s technology) in the UAE rather than in Switzerland, can potentially save significant costs and shorten periods for resolution. The first case brought before CAS Abu Dhabi for resolution is currently waiting for a decision. The case involved the appeal of an Indian swimmer, Amar Muralidharan, against a doping ban. The swimmer based his appeal against the decision of the Indian national anti-steroids committee in New Delhi, which convicted him of using banned substances and issued a suspension from competition for two years. The CAS assigned seasoned independent arbitrator, Michele Bernasconi, from Switzerland, to hear the case as a sole arbitrator. Muralidharan, his two lawyers and his father attended the first hearing. 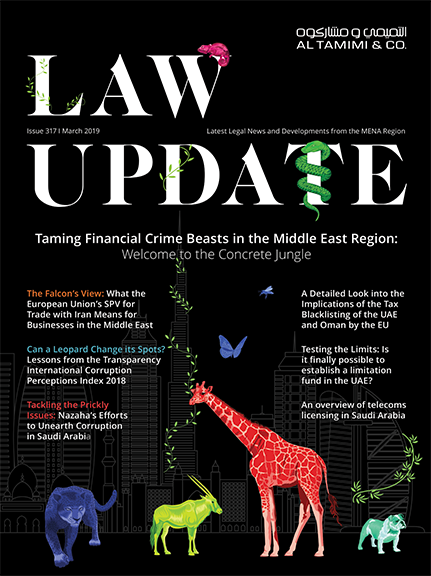 At the time of printing this article, a follow up with the Abu Dhabi CAS centre indicates that the case is still under scrutiny and a determination of the appeal is imminent. In a previous case with some similarities heard by CAS: United States Olympic Committee v International Olympic Committee CAS 2011/0/2422, CAS referred to the generally-applicable principles of sports law, in a review of its own jurisprudence declaring what was at that time Rule 45 of the Olympic Charter unlawful. Rule 45 had been introduced to impose a greater sanction on athletes found guilty of a doping offence and suspended from competition for six months or longer; in such a case, the athlete would be banned additionally from competing in the summer and winter Olympic Games immediately following the completion of their suspension. CAS held Rule 45 to be unlawful primarily on the grounds that by introducing an additional punishment unilaterally that was not sanctioned by the World Anti-Doping Agency Code, the International Olympic Committee had not followed its own rules and procedures. In other words, it had acted ultra vires, or beyond its powers. The introduction of fundamental generally applicable or universally accepted principles of law into the jurisprudence of CAS provides it with an opportunity to set minimum standards of procedural fairness and governance that are applicable across all sports to compliment its ability to cater to the specificity of sport. Furthermore, it provides CAS’s decisions with an underpinning legalism that mature legal systems consider integral to continued and reliable operations. Rihab El Amin is a senior associate in Al Tamimi’s litigation practice based in the Abu Dhabi office and is also a key member of the sports law practice.